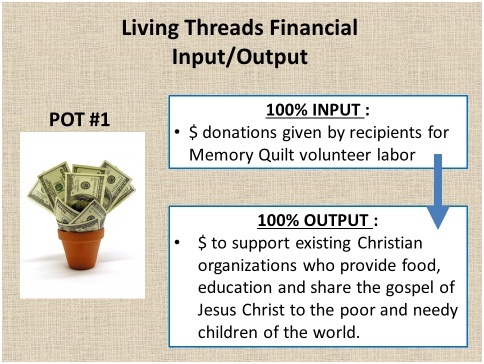 The best way to explain how Living Threads is funded is through the graphics of two pots. 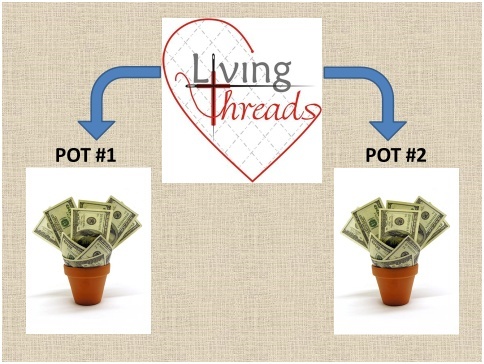 At Living Threads, we actually have two separate “pots” of funds. POT #1 has ONE source of income and ONE expense. When a client comes to pick up their memory quilt, they have been made aware of how many total hours the volunteers have donated in making their quilt. The family is asked to make a donation for those hours and ALL (100%) of their donation goes directly into Pot #1. The only output from this pot is support for poor and needy children in the world, currently in the Kibera Slum of Kenya. As you can clearly see 100% in, results in 100% out for children. The world would say this makes no economical sense, but when following God’s calling this is called OBEDIENCE, doing exactly what He has asked Living Threads to do. -HOW are we able to provide purpose & a place for our volunteers to serve? -HOW are we able to go to Kenya to encourage, support & monitor? -HOW are we able to be located at City on a Hill, have equipment, supplies, staff? -HOW are we able to hold Bible Block of the Month classes providing emotional, social, & spiritual support to so many women? The only answer is with Pot #2. Pot #2 is what sustains Living Threads and without this piece supplied, Living Threads would cease to exist. 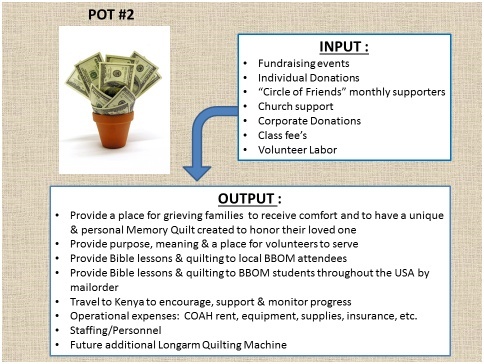 The Output from Pot #2 are ALL the expenses Living Threads has over and beyond our support for the six Bible clubs we support in the Kibera slum. Without Pot #2, Living Threads would be unable to serve grieving families with memory quilts and then without that we’d be unable to provide for the children in the Kibera Slum because we would have no operating income. God gives the opportunity for all of us to be part of HIS bigger plan, for HIS Kingdom purposes. If you would like to participate in how God is using Living Threads to serve the community and beyond, your contribution of any size is greatly appreciated. Please (click here) for ways to donate.